It’s a story about a very common man at Delhi NCR region. He doesn’t have many degrees in his pocket and he didn’t even see any management school either in his life. However, he has been managing a business gracefully from last 10 years with his passion and conviction. Salute to our beloved “TAU”. Yes, all people here in the area called him Tau with love. It’s located at Delhi NCR sector 15. Tau is at 65 now and he’s the one man army here. After getting up at morning 5 AM, he starts to clean all the nook and corner of the PG, then goes to the vegetable market. After coming back around 7 AM, he starts preparing breakfast for 40 people with his helper Lokesh and he loves to provide daily breakfast with different varieties of good quality food. His memory power is so strong that he can remember who loves what and he tries to make that kind of food at least once in a week. Then he takes care of the laundry part as well as other important necessary things. Also, he loves to prepare dinner with varieties and hygienic food. Boys literally feel overwhelmed after having this kind of arrangement. They don’t feel they are staying aloof from their home. You might be thinking the charges of the accommodation would be high but guys this is fewer reasonable able at Delhi NCR. If you are staying at this PG, you’ll be surely pampared by Tau. He calls boys at morning for the tea and after preparing breakfast he serves it by himself with care. He always loves to do his own work from shoe polish to worship his god. There is no restriction for religion or cast here and, moreover, he has been maintaining the hygene part from a long time. It’s not easy for everyone to maintain such daily routine for 10 years. His management skill is really commendable. If you ask him about his age, he’ll say, it’s just a number. 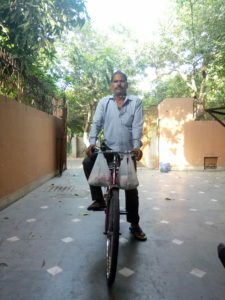 Apart from daily PG routines, he loves plantation and gardening, he loves cycling with his old cycle. Local residents respect him a lot and he also helps them in different circumstances. Guys, money doesn’t bring happiness all the time, it’s about your work what you love to do. Tau is a great inspiration for all the PG residents and they have lots to say about him which can’t be explained in this short story. So, friends, age is nothing, you should be mentally strong, Be like Tau, Be a DOER.